Rosemary Broderick works overnights at a drug rehabilitation program, but still must rely on food stamps to help feed her daughter. Boston is a city of haves and have-nots, and a new study by the Boston Redevelopment Authority quantifies the growing divide, portraying the trend in stark numbers that show few benefits from the economic boom going to those near the bottom of the income scale. Despite much attention given to high-paying jobs in technology, biotechnology, and finance, nearly half of Boston residents make less than $35,000 a year, the study shows. Incomes, when adjusted for inflation, have not risen for such workers for three decades. The report, to be released Tuesday, portrays a local economy sharply divided by race, class, and education, with shrinking opportunities for those trying to climb the economic ladder. About 40 percent of jobs in the city require at least a bachelor’s degree, for example, compared to less than 27 percent nationally. Jobs that don’t require a college degree are mostly in low-paying sectors such as hospitality and food service, which rely heavily on part-time labor and force many workers to string together two or three jobs to barely get by. What’s missing are the jobs with decent pay and benefits in between. Affluence is surging in some areas of Boston, while poverty remains deep in others, creating a city of neighborhoods that are separated by more than distance. “The complicated problem is how we move people from one level to another,” said Alvaro Lima, the study’s author and director of research for the Boston Redevelopment Authority. The administration of Mayor Martin J. Walsh is focused on workforce development and education as a way to create career paths and upward mobility for residents. This study, which analyzed census data, will be paired with an inventory of local training programs to create strategies to combat income stagnation and move people out of low-wage jobs. 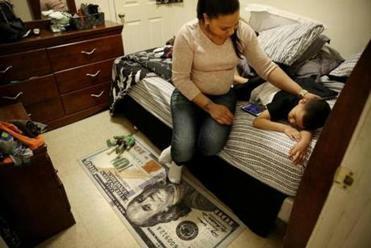 Income inequality is rising nationwide, but it is particularly stark in Boston, which has the highest rate of economic disparity among the 100 largest American cities, according to the Brookings Institution, a nonprofit research organization in Washington. Its study, released in January, found that households in the top 5 percent in Boston made at least $266,000, nearly 18 times as much as households in the bottom 20 percent. For many workers, the path to prosperity is unclear. Steven Davis drives a delivery van in the Financial District, making roughly $26,000 a year as a part-time contractor. With two kids, ages 10 and 6, money is tight. Davis, 47, started college but never finished it, and he’s leery of taking out loans to get his degree. With the high cost of living in Boston and no job guarantees, he said, borrowing to go back to school would be risky. “The hole is deep if you make the wrong move,” he said. Opportunities for those in the bottom income brackets have shrunk, along with funding for job training and English classes, said John Drew, president of the antipoverty organization Action for Boston Community Development. At the same time, the skills and education necessary for entry-level jobs have risen, with employers sometimes requiring bachelor’s degrees for jobs that could be filled by someone with a certificate or associate’s degree. 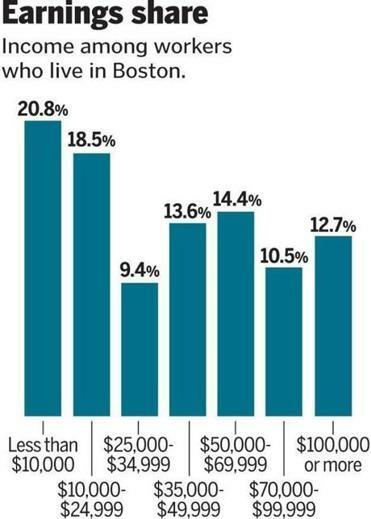 Boston residents also make lower wages than those living in surrounding communities, the report said. People who live and work full time in Suffolk County make 8 percent less than those who commute into the city, even when differences in education and other factors are considered. The disparity could be caused in part by racial and gender discrimination, as city residents are more likely than suburbanites to be minorities and female, the report said. Hispanic workers’ median annual income, for instance, is less than half that of whites’, and education doesn’t necessarily help. Hispanic residents with associate’s degrees, for example, have median earnings of about $28,000 a year, $2,000 less than white workers with just high school diplomas. Addressing race-based inequality is key to shrinking the income gap, as the city’s population of people of color continues to grow, said Paul Grogan, president of the Boston Foundation, a philanthropic nonprofit that has studied income inequality. Boston’s minority population has increased to 53 percent in 2010 from about 5 percent in 1950, according to the Boston Redevelopment Authority, but most people of color do not have college degrees. Three-quarters of all Boston residents with bachelor’s degrees are white, according to the BRA study. Rosemary Broderick, of South Boston, knows she needs a degree to make a better life for herself. 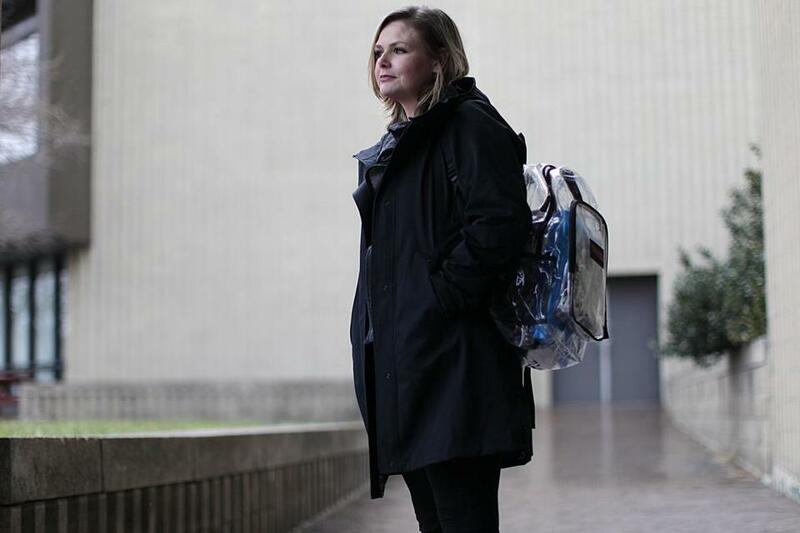 Broderick, 32, works overnights at a drug rehabilitation program for teenage girls, making $11.50 an hour, and relies on food stamps and a free Head Start program for her 4-year-old daughter. She is working toward an associate’s at Bunker Hill Community College and then, she hopes, a bachelor’s. Broderick lives with her mother, in the same housing development she grew up in, and a friend baby sits for $5 an hour. She longs to get out of South Boston, where she can see the extremes of wealth and poverty practically out her front door. The city plans to use the workforce study to put strategies in place to “move the needle on upward mobility and income inequality,” said Trinh Nguyen, director of Boston’s Office of Workforce Development. For example, Nguyen is working with community agencies and employers to create more training to help workers move up the career ladder and develop “learn and earn” models that allow people to gain college credit for work experience. The city is also trying to integrate credit building, English classes, and adult education into workforce development programs to give people more tools to succeed.